Goma fire rituals are performed a number of times between midnight and 5 P.M. on New Year’s Day before Izuna Daigongen, whose image in the Main Hall is on public display. The ritual is performed to pray for family health and happiness throughout the coming year. The ritualist on this occasion is the head priest of Yakuo-in, who performs the goma for the sake of the thousands of people who visit the temple on New Year’s Eve and New Year’s Day. At sunrise, the summit of the mountain reverberates with the sound of the conch shells blown by yamabushi (mountain ascetics) and the sutras recited by the priests, as people gather to welcome the first day of the year. 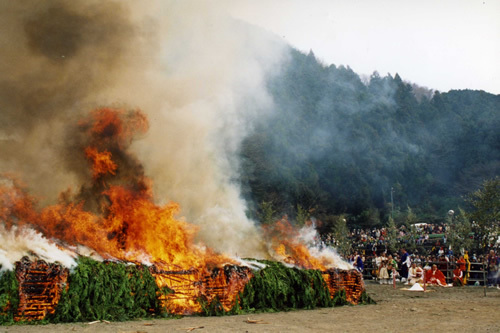 This is called Geikosai, the festival to welcome the light. Around February 3 every year, several times a day, men and women born under the same calendrical sign as the current year strew dried beans from the Main Hall, in the company of sumo wrestlers, singers and actors who have been prominent the preceding year. They do this after being purified of all evil spirits by a goma ritual. This ceremony is held to cast out bad fortune and to invite good fortune to enter the home. It is said that if you eat the beans, you will be free of illness and misfortune for the next year. 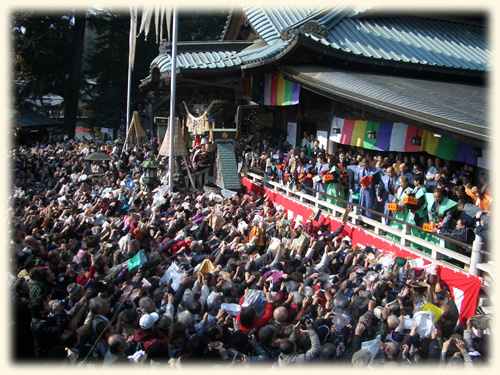 On the second Sunday of March each year a large open-air fire ritual called Saito Goma-ku is held in the open area in front of the Kito-den Hall at the foot of Mount Takao. As though it were by the hands of Izuna Daigongen, worshippers rub their bodies with sticks called nadegi, which are later thrown into the flames. When the fire dies down, yamabushi and participants walk barefoot over the hot coals, praying for protection against sickness and calamity and for safety within the family. 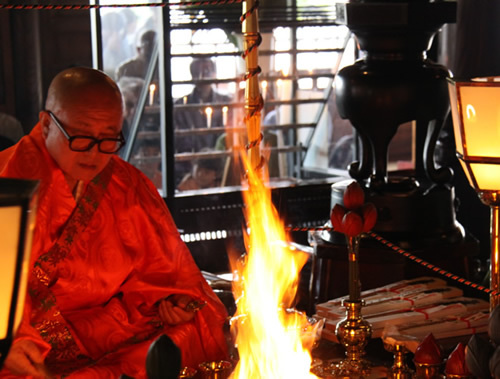 The flames are considered to purify people by burning all defilements away. Copyright(c)2010 Takaosan Yakuouin. All Rights Reserved.